With a whopping one third of all food produced globally lost or wasted between farm and fork, food loss and waste (FLW) has become a top-of-mind topic for the agro-food industry and the sustainability sphere in general. Volume has largely dominated the discussions around FLW and has ultimately shaped the way we measure success. UN Sustainable Development Goal 12.3, for example, is framed in terms of volume, seeking to halve all food loss and waste by 2030. Despite what the scale may say, not all food waste has the same impact or value. To align FLW mitigation with sustainability goals, such as the 2°C target, there is a need shift the conversation about FLW from volume to value. Reducing food loss and waste presents opportunities to lower costs and generate new revenue, but the real value it delivers is reducing pressure on the environment and supporting the global food system in delivering nutrition. To help transform thinking about FLW, environmental sustainability consultancy Quantis and WBCSD’s project FReSH have developed the Food Loss and Waste Value Calculator. The tool launched in a beta version in October 2018 with the aim of helping businesses create more intelligent waste reduction strategies and focus time, effort and resources where they can have the biggest impact and create the most value with respect to sustainability. The calculator was developed through the WBCSD FReSH program with support from World Resources Institute (WRI) as a supplement to the FLW Reporting Standard. The 1.6 billion tons of FLW created each year is a staggering figure that has considerable environmental, social and economic impacts. FLW accounts for eight percent of global greenhouse gas (GHG) emissions, generates $940 billion in losses annually to the global economy and puts food security at risk. The calculator can help direct our actions towards these sustainability problems, and see beyond just the volume of waste being generated. Measurement is an essential first step in developing robust waste reduction strategies, giving businesses a glimpse at what is being lost and wasted, as well as how much. But these numbers only tell part of the story. Food types vary significantly in the amount of resources required to get them from seed to plate and therefore have very different impacts in terms of GHG emissions, water consumption and land use. Caloric and nutritional content also varies. Equal amounts of beef and lettuce do not have the same impacts or nutritional value. For example, a tonne of beef contains 2.5 million kilocalories, and has a carbon footprint of about 30,000 kilograms of CO2-eq, whereas a tonne of lettuce contains 150 thousand kilocalories, and has a carbon footprint of about 200 kilograms of CO2-eq. This tells us that beef waste is much more calorie-dense and carbon-intensive than lettuce, which is backed up by existing nutritional information and environmental impact assessment data. However, if a retailer is wasting 1000 tons of lettuce and only 5 tons of beef (200 times less), the lettuce would actually have a higher carbon footprint and have delivered more nutritional energy. Without combining the volume of FLW with the environmental impact assessment data and nutritional information, this would be overlooked. The Food Loss and Waste Value Calculator takes these factors into consideration to instantaneously provide decision-making guidance at a screening level. By layering weight-driven data with environmental and nutritional metrics, the Food Loss and Waste Calculator provides a more complete picture of the impacts of different foods and the value of reduction efforts. To use the calculator, users enter data or predictions about wasted products, including food type and region of production, the amount of waste generated, the life cycle stage at which the food loss and waste occurs, and waste destination (i.e. landfill, animal feed, biochemical processing, etc.). The tool instantly calculates food loss and waste in terms of nutritional values and environmental impacts. The resulting figures can be used to inform decision-making and develop targeted reduction strategies that prioritize the most important food loss and waste streams. To-date, many food waste-focused tools have been tailored to consumers with the aim of driving behavioral change. 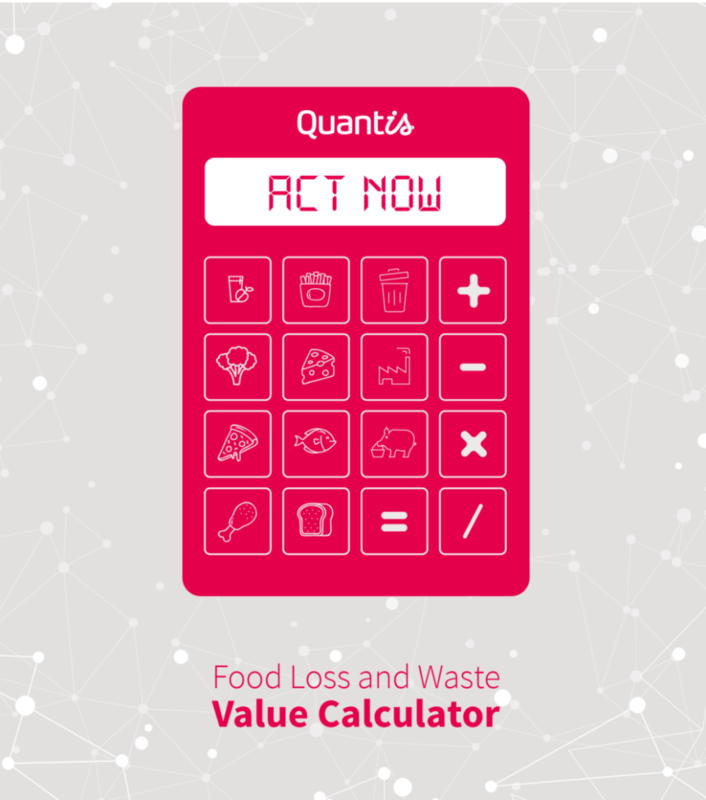 Building on the Food Loss and Waste Accounting and Reporting Standard and Quantis’ extensive experience in modelling the impacts of agrifood systems, the FLW Calculator is the first of its kind to target food loss and waste at every step of the supply chain (from post-harvest losses up to consumer-end waste) and aimed at multinational businesses. Food loss and waste represents an important business opportunity — companies that effectively take action to reduce waste can expect to reap a number of benefits, from lower costs to new revenue opportunities and improved reputation. Businesses can position themselves to tuck into these benefits almost immediately by simply targeting the largest food and loss waste streams first, but to truly make an impact, they have to reach beyond the lowest hanging fruits and get smarter about where they focus their reduction efforts. The FLW Calculator allows companies to take a science-based approach to their waste reduction strategies, and therefore filter time, effort and resources to where they matter most. By using the tool to estimate and compare the impacts of their different FLW streams (GHG emissions, water use, etc.) companies can have a better view of their hotspots and prioritize those with the largest environmental footprints or represent the greatest loss of nutritional value. The information generated by the calculator can also be used to support sustainability managers in building a strong business case to obtain C-suite buy-in and aligning FLW strategies with larger sustainability goals, such as water stewardship or carbon footprint reduction. Delivering on UN Sustainable Development Goal 12.3 to halve food loss and waste by 2030 will not be possible without the participation and leadership of the private sector. Prioritization of the most important waste streams will be an important factor for advancing towards this goal. As such, there is a need for robust, yet easy-to-use tools that help businesses quickly and efficiently manage food loss and waste occurring throughout the supply chain. Though in the early stages of development, the FLW Value Calculator has the potential to fill this gap and catalyze meaningful change. A beta version of the calculator is available on the Food Loss and Waste Protocol website for interested businesses and organizations to download and pilot. This initial pilot phase will be used to assess the usefulness of the tool for business, ensure that it reflects the latest science of food loss and waste impacts, and further develop and refine the calculator. Contact Sustainability Consultant and food expert Alexi Ernstoff to join the pilot and to learn more.